When Anders Larsen, a lonely museum curator, answers it, neither does he. They're both searching for something - they just don't know it yet. Sl When Tina Hopgood writes a letter of regret to a man she has never met, she doesn't expect a reply. To ask other readers questions about Meet Me at the Museum, please sign up. This is a short and moving epistolary novel from Anne Youngson about the unexpected blossoming of a late flowering love sparked entirely through the letters between them. In Bury St Edmunds Tina Hopgod, is a hard working farmer's wife and grandmother, and Professor Anders Larsen, is a curator of a Silkeborg museum in Denmark with its prized mummified corpse of Tollund Man from the Iron Age. In 1964, Professor PV Glob wrote a dedication in his book, The Bog People, to a group of schoolgirls, whic This is a short and moving epistolary novel from Anne Youngson about the unexpected blossoming of a late flowering love sparked entirely through the letters between them. In Bury St Edmunds Tina Hopgod, is a hard working farmer's wife and grandmother, and Professor Anders Larsen, is a curator of a Silkeborg museum in Denmark with its prized mummified corpse of Tollund Man from the Iron Age. In 1964, Professor PV Glob wrote a dedication in his book, The Bog People, to a group of schoolgirls, which included Tina. Now in her 60s, Tina writes a letter to Glob, not realising he has long since died, Anders replies and so begins the relationship cemented by their loneliness that helps to assuage their grief and loss, filling the unbearable holes that proliferate in their souls. What a wonderful surprise this gem of a book was for me. I do not recall how I learned of this book but I recall seeing my library got the audio and I immediately put myself on the list. Finally, it arrived and I jumped right in. I pushed through this, wanting to know what would happen, not wanting it to end. The story is told in alternating letters from Tina Hopgood, who lives in England, and Professor Anders Larsen, who lives in Denmark. Tina writes to the Silkeborg museum, sending a letter to What a wonderful surprise this gem of a book was for me. I do not recall how I learned of this book but I recall seeing my library got the audio and I immediately put myself on the list. Finally, it arrived and I jumped right in. I pushed through this, wanting to know what would happen, not wanting it to end. The story is told in alternating letters from Tina Hopgood, who lives in England, and Professor Anders Larsen, who lives in Denmark. Tina writes to the Silkeborg museum, sending a letter to Professor PV Glob, who wrote a dedication in his book to a bunch of schoolgirls (Tina being one of them) long ago. Since he has passed, it is Professor Anders, the museum curator, who gets the letter from Tina and responds. So begins this beautiful art of letter writing...really, actually writing letters back and forth. OK, so eventually they switch to email, only to increase the frequency of their correspondence. Both are somewhat lost, almost drifting through life, but this unlikely friendship blooms and each becomes a stronger person. I don't want to say more and give anything away in this one. This is a beautiful, beautiful book. Meet Me at the Museum is told solely through letters between Tina Hopgood, a farmer’s wife in England, and Anders Larsen, the curator at a Danish museum. As they continue to write back and forth to each other, their lives, loves and losses are unveiled to each other and the reader. I savored the book and the story trying not to rush through it because it is such a poignant and wonderful tale. Youngson’s writing is thoughtful and lyrical, and her reflections on life and the passage of time are captivating. Portions of this book reminded me a bit of Our Souls at Night by Kent Haruf, a favorite book of mine. I highly, highly recommend Meet Me at the Museum; it is well worth the read. They have never met. They have never even seen a picture of the other. They live over 700 miles apart. Yet, they have found more comfort and companionship in each other than they ever thought possible. Tina Hopgood lives in East Anglia, England, on a farm. She has lived there with her husband for over 30 years. Her children, now adults, are part of the farm and her daily life. Tina writes a letter intended to be received by Professor P.V. Glob, a Danish archaeologist at the Silkeborg Museum in Denmark. A book that was dedicated to her by this Professor when she was a child, had prompted her to write to him. His discovery and excavation of the well preserved Tullund Man from the bogs of Jutland, is a memory that stayed with her over all the years. One of these days, she will make the trip to the museum to see this man from 250 BC, herself. Anders works at the Silkeborg Museum in Denmark. He receives a letter from a Tina Hopgood from England, intended for Professor P.V. Glob. But the Professor had died several years ago and Anders politely writes her back sending along some general Museum information. Not a long while later, Trina writes back as a means of explaining how all of this has become so important to her and why she has waited so long to follow this interest. Anders politely replies. And this continues, not by e-mail, but the old fashioned way through the postal system. Anders begins to open up about his work and inquiries about her natural surroundings living on the farm in the countryside. Their letters carry on for a timespan of about a year with conversations ranging from history, ecology, herpetology and biology, to venturing into their personal lives, their children, their thoughts, likes and dislikes. Until one day….it stops! Inspired by the actual Tollund Man and the real Silkeborg Museum in Denmark, this epistolary novel is all about friendship. Trina and Anders share a deep connection that evokes them to think. They are not always of the same opinion, but feel they can respectfully express themselves to the other. Their vulnerabilities makes this novel sweet and real. The plotline expands beyond the two characters involving their families and what is happening in their lives. In parts you forget you are reading this entire novel in letters. There are moment of joy, despair, hope and loss. It is not a fast paced read. It renders so much honesty and simple goodness, it does not require speed or loud activity. It is a journey inward in a sense. Something to read while sipping hot cocoa. Very lovely and sweet. I received a digital copy of this ARC from Netgalley in exchange of an honest review. All opinions are my own. Thank you kindly. January can be a tough month, and for anyone who needs their spirits lifted, I recommend this sweet and gentle story. Tina is a sixty-something English woman, struggling with the loss of her dear friend Bella. They had always planned to travel to Denmark to see the Tollund Man, an archaeological discovery that struck a chord with them as schoolgirls. She writes to the museum that displays it and receives a reply from Anders, a curator. He encourages her to visit, even without Bella. They begin to January can be a tough month, and for anyone who needs their spirits lifted, I recommend this sweet and gentle story. Tina is a sixty-something English woman, struggling with the loss of her dear friend Bella. They had always planned to travel to Denmark to see the Tollund Man, an archaeological discovery that struck a chord with them as schoolgirls. She writes to the museum that displays it and receives a reply from Anders, a curator. He encourages her to visit, even without Bella. They begin to exchange regular correspondence. A friendship develops and we find out more about their lives. The tone of their letters is often wistful. Both Tina and Anders look back on life with feelings of regret. Tina became pregnant with her first boyfriend and married him out of a sense of obligation. Though she and Edward have three grown children, their relationship is loveless. She also feels unfilled by her role as a farmer's wife. Anders is a widower and lives alone. He loved his wife very much but we learn that their marriage had its own difficulties. Anne Youngson's debut is a charming epistolary novel about strangers who discover themselves in letter writing. Tina's one fatal mistake lead to a life as a farmer's wife, and now that her best friend has died she is struggling to find purpose and meaning. Tina writes to Prof. Glob about the Tollund Man, which she longs to see for herself. She learns that the Professor has died when Anders, a museum curator, responds. They continue to write to each other and a friendship grows. As they share their ideas, losses, and disappointments, the reader observes a meeting of minds and hearts blossoming. Meet Me at the Museum was inspired by the Tollund Man, the prehistoric preserved body which in 1952 was discovered in a Danish bog. Professor P. V. Glob excavated the remains and wrote the book The Bog People, which I remember reading in the early 1970s. In 1970 the poet Seamus Heaney wrote the poem The Tollund Man. Youngson was haunted by the poem and the image of the Tollund Man, intrigued by the mystery of the man's life and death. This quiet novel, in which nothing much happens, about people who are not in themselves anyone in particular, will not engage readers who prefer a plot line that catapults you into a page-turning frenzy. It was a perfect read as I sat under the apple trees on my patio, the robins splashing in the bird bath and the bees flocking to the flowering oregano in the herb garden. Complications do arise in the character's lives and decisions must be made. But the book is about Tina's and Ander's self-analysis and evolving thoughts on matters and ideas and choices and life. It is the story of a slowly blossoming relationship built on an open exchange of ideas, communicating about their internal and external growth. They share lessons they have learned. Such as Tina's observation that when raspberry picking, you go down the row and select all the ripe berries, then turn around and note all the ones you missed because you only saw one side of the bush. Can people go back and find the berries they missed on the first walk through life? That is what the novel is about. The promotional blurb accompanying this title appealed to me because it mentioned letter writing and Scandinavia, two themes guaranteed to arouse my curiosity. That it concerns also a profound friendship developing between two people who know each other simply because of words on paper was, for me, a delightful bonus. Meet Me at the Museum is 70-year-old British author, Anne Youngson's debut novel. Prior to her entry on to the literary scene she worked at senior level in product development for The promotional blurb accompanying this title appealed to me because it mentioned letter writing and Scandinavia, two themes guaranteed to arouse my curiosity. That it concerns also a profound friendship developing between two people who know each other simply because of words on paper was, for me, a delightful bonus. Meet Me at the Museum is 70-year-old British author, Anne Youngson's debut novel. Prior to her entry on to the literary scene she worked at senior level in product development for a major car company, and has since supported many charities in governance roles, including becoming Chair of the Writers in Prison Network. Her tale of obligation, loss of self and a 4th century BCE mummified corpse discovered on the Jutland peninsula centres on the lives of two people who, on the face of it, appear to be utterly mismatched. He, Anders Larsen, the cerebral curator of a museum in Silkeborg. She, Tina Hopgood, a hard-working farmer’s wife from Bury St Edmunds. But fate and a bog body bring them together, enabling them to develop a rich, empathetic bond. They find they are alike in many ways: both have grown-up children, both have experienced painful losses, and both quietly survive each day without truly living. Their gentle philosophising and shared memories become a necessity to them. Anders ponders beauty and violence, while Tina reflects on her love of poetry – in particular, Seamus Heaney’s The Tollund Man. At one point a merman is mentioned, and I half expected us to drift into the realms of magical realism, but no, these characters are way too pragmatic to believe in the existence of such creatures. Meet Me at the Museum is an epistolary story of love and selflessness. Not only do the words of Anders and Tina lift them above long-held feelings of monotony and despondency but they fill each other with hope for the future. They put a smile on the face of this reader, too. This year’s Midwinter Break. A charming, bittersweet novel composed entirely of the letters that pass between Tina Hopgood, a 60-year-old farmer’s wife in East Anglia, and Anders Larsen, a curator at the Silkeborg Museum in Denmark. Tina initially wrote to P.V. Glob, the Danish archaeologist and author of The Bog People, which explored the mystery of the Tollund Man, to thank him for dedicating his book to her and her schoolgirl friends. Larsen informed her that Professor Glob was dead, but also This year’s Midwinter Break. A charming, bittersweet novel composed entirely of the letters that pass between Tina Hopgood, a 60-year-old farmer’s wife in East Anglia, and Anders Larsen, a curator at the Silkeborg Museum in Denmark. Tina initially wrote to P.V. Glob, the Danish archaeologist and author of The Bog People, which explored the mystery of the Tollund Man, to thank him for dedicating his book to her and her schoolgirl friends. Larsen informed her that Professor Glob was dead, but also kindly replied to the subtext of Tina’s letter. She is desperate to find meaning in her older age, and mourning the death from breast cancer of her best friend Bella, who always swore that they would go see the Tollund Man in person at the Silkeborg Museum. Gradually Tina and Anders’ letters become less formal and more intimate (watch for the changes in how they start and sign off) as they describe their daily lives and their regrets. They are outwardly very different – Tina works mostly outdoors and lives in a cluttered, chintzy farmhouse; Anders works indoors, usually at a computer, and has a typically Scandinavian minimalist home – but both have grown discontented with the smallness of their lives and come to rely on each other’s emotional support when they face family crises. Ok, first of all, I have always been a sucker for epistolary novels - from Richardson to Laclos to Stoker and Shelley to Helene Hanff to Alice Walker to A. S. Byatt to Julie Schumacher, etc. etc., there is just something about the form that I find immensely appealing... so I was somewhat predisposed to like this from the get go. I do enjoy an epistolary novel, especially when it is done well – and Meet Me at the Museum is very well written indeed. Tina Hopgood, a farmer’s wife from East Anglia and Anders Larsen, curator of the Silkeborg Museum in Denmark strike up an unlikely friendship when Tina sends a letter addressed to a Professor Glob who 50 years before had dedicated a book to Tina and her schoolfriends about his discovery of the ‘Tollund Man’, an Iron Age man found in a bog whose preserved body (or the remains of) lies in the museum. Tina and her late friend Bella, always meant to visit the museum but neither of them ever did and Tina writes to explain her regret, not knowing whether or not the Professor is still alive. It turns out that Professor Glob is long dead but her letter is picked up by Anders and this is where their correspondence begins. The story of Tina and Anders is told entirely in letters between the two of them. They start off on a formal basis conversing about the Tollund Man and their shared archaeological interests but as the correspondence continues it reflects their growing friendship and they find themselves confiding in each other about their feelings, their lives and families and seeking advice from the other. For some reason it is often easier to unburden yourself to a stranger than to a loved one. Meet me at the Museum is a thoughtful and touching story of two people whose intimate thoughts and, also regrets, are entrusted to someone they have never met. Don’t expect a fast paced read. This book is very much a gentle character driven narrative. The timeline is set in a period of just over a year and in that time nothing happens but then again, everything happens, as Tina and Anders bare their souls to each other; by the end of the book neither of their worlds will be the same again. This was a really lovely little book about grief and finding yourself later in life. It’s an epistolary novel between a British farm wife who recently lost her best friend and a Danish museum curator who recently lost his troubled wife. They develop a close relationship and help each other overcome grief and loneliness through their letters. I so enjoyed this little book! The combo storyline of Tina and Anders’ relationship by correspondence, and my being totally captivated by the story of The Tollund Man made this a two for one win for me. Now, while The Tollund Man plays a role in the telling of this story, he is NOT 100% the story. I want to make that perfectly clear so as not to scare some readers off! The Tollund Man. Do you know about him? I did not know about him specifically, but I had read of the uncovering of bodies (The B I so enjoyed this little book! The combo storyline of Tina and Anders’ relationship by correspondence, and my being totally captivated by the story of The Tollund Man made this a two for one win for me. The Tollund Man. Do you know about him? I did not know about him specifically, but I had read of the uncovering of bodies (The Bog People they are called) from over 2,000 years ago! The Tollund Man was buried in 250 B.C. and found during an excavation led by a Danish archaeologist, Professor Glob, in 1950. The Tollund Man was so remarkably well preserved in the peat/bog pits where he lay for all these years. His body, some of his clothing, as well as the noose around his neck and his belt and hair, are perfectly preserved back from the Iron Age. An absolutely stunning and astounding bit of history and archaeology! The story begins with a woman, Tina, who is now older and is a farmer’s wife and mother. She is writing to the Professor at the museum about The Tollund Man. She and her best friend, Bella, in their younger years and happier days, have always wanted to go to Denmark to the Silkeborg museum to see the preserved and reconstructed remains of The Tollund Man. The (now deceased) Professor, had written a book called “The Bog People” in 1969 and dedicated the book to thirteen schoolgirls who had written to him about his archeological studies, one of the girls being Tina. Fifty years later, Bella has died; Tina gets to wondering about her life choices. She goes through the motions of being a farmer’s wife. She’s not really happy; it was not her choice. Shes trying to figure out the meaning of life, her life and her choices. She still obsesses about going to the museum and seeing the remains of The Tollund Man; still, she does not go. She does not want to go alone. Anders, the curator at the museum writes Tina back that the good Professor Glob is deceased and Anders offers his own assistance and an invite to visit the museum. From this initial contact, these two develop a letter writing relationship that goes from business to friendship and gets deeper and more personal over time. There are attributes that The Tollund Man has that Tina yearns for - dignity, serenity, wisdom, resignation. Yet, that pull is there to see The Tollund Man; she still does not go to the museum. Their continual letters back and forth between Tina and Anders reflect on their daily lives and families and feelings; you will note on the closing of their letters to each other that the signature becomes more personal and affectionate. In their letters they share their past, their secrets, their hopes and dreams, their problems. I felt like I was reading someone’s private letters with their personal thoughts to only be shared with each other; this was integral to the whole storyline. You will need to read this book for three reasons: to find out what happens to Tina, to find out what happens to Anders, and to find out how The Tollund Man continues to play a part in their lives. I happen to love epistolary novels and Meet Me at the Museum is in the tradition of Guernsey Literary and Potato Peel Pie Society, 84, Charing Cross Road, and Last Christmas in Paris with the tenderness of finding a soul mate later in life as in Our Souls at Night. Even though the story unfolds in letters, we become interested and invested in the lives of Tina, an English farm wife, mother, and grandmother, and Anders, a qu Letter writing: “holding onto the softness and elegance” of the old ways. I happen to love epistolary novels and Meet Me at the Museum is in the tradition of Guernsey Literary and Potato Peel Pie Society, 84, Charing Cross Road, and Last Christmas in Paris with the tenderness of finding a soul mate later in life as in Our Souls at Night. Even though the story unfolds in letters, we become interested and invested in the lives of Tina, an English farm wife, mother, and grandmother, and Anders, a quiet, kind, and thoughtful museum curator. We follow their correspondence and form opinions as they each navigate an unexpected crisis. As a bonus, I also learned a great deal about The Tolland Man from the Iron Age! Fans of character driven stories, literary fiction, and reflective writing will find Meet Me at the Museum an enjoyable read. Book clubs might find some thoughtful discussion topics, and, of course, if you enjoy the art of letter writing this is a must read. If you’re looking for a fast paced, page turner filled with suspense and lots of action or if you know you don’t enjoy epistolary format, you might want to skip this one. Meet Me at the Museum is more than the ‘women’s fiction’ category suggests. I tend to associate women’s fiction with ‘chick lit,’ and I assure you it’s not that. It’s a read that grew on me and one that I enjoyed more and more as I delved deeper into the story, their lives, and their relationship. It’s a quiet, beautifully written story and perfect for reading in front of the fire on a winter night or on a porch swing on a lazy summer day. This is a short novel at just 224 pages, but it's a story that creeps into the heart and stays there. Wonderfully written, centred on just two main characters, but beguiling and beautiful and so very insightful. Tina Hopgood had always planned to visit the Silkeborg Museum in Denmark. Fifty years ago a book written by Professor Glob from the Silkeborg was dedicated to her and thirteen of her schoolfriends. Tina is now a farmer's wife in Bury St Edmonds, East Anglia, and whilst she and her friend This is a short novel at just 224 pages, but it's a story that creeps into the heart and stays there. Wonderfully written, centred on just two main characters, but beguiling and beautiful and so very insightful. Tina Hopgood had always planned to visit the Silkeborg Museum in Denmark. Fifty years ago a book written by Professor Glob from the Silkeborg was dedicated to her and thirteen of her schoolfriends. Tina is now a farmer's wife in Bury St Edmonds, East Anglia, and whilst she and her friend Bella often talked about when they would visit, it never was quite the right time. Now Bella is gone and Tina has written to Professor Glob about who she is now and why she never visited. Of course, Professor Glob died years ago, but Tina receives a response from the current curator; Kristian Larsen. This is the beginning of an extraordinary relationship between them; two people who appear to have nothing in common, until they begin to open up about their own individual lives. At the heart of Meet Me At the Museum are two lonely people. Kristian lives alone, his wife is dead, his children live in other cities. Tina, on the other hand, lives amongst a large family; her husband, children, their partners and her grandchildren are all around her, every day. Yet, she is lonely. Her letters to Kristian reveal a woman who married and helps to run a farm, almost by accident. It's not something she ever yearned to do, but it's expected of her, and she carries out her duties willingly. Yet, still, she is very lonely. As the letters flow back and forth across the continent, Tina and Kristian become more familiar. The use of their names, the tender signing off at the end of each letter; these things grow, letter by letter. As they write, it is apparent that they are sharing things that they've never vocalised before, maybe never even admitted to themselves, and the reader is witness to their gently unfurling stories. Sometimes funny, always full of facts that could be mundane, but are rendered quite beautiful through the author's words. There's sadness and pain, confessions of regret and anger, yet it is always such a joyful and tender look at a blossoming relationship. Meet Me At the Museum touched me so much. I was enraptured by the writing, and loved the structure of the letters. This is such a simple story, yet is told with a passion and emotion that is quite breathtaking. A wonderfully written story, and highly recommended by me. Read for a book group but this was incredibly apropos timing for me, which added to the experience. Sometimes had to put it down, sometimes couldn't put it down. Loved the evolution of their salutations & farewells, might be my favorite part. This little epistolary book slowly made its way into my heart. It is a story about grief and friendship. It was a book that took me awhile to finish- simply because I wanted to savor the gorgeous writing. It was a delight to watch the growth of the characters through the pages. Upon reflection, it reminded me of ‘Our Souls at Night’ by Kent Haruf which I adored for its quiet, yet moving prose. This unique book will stick with me for a long time. The Tollund Man and related theme of being buried in one's own life is poignant, especially in midlife. And the process of getting to know the characters strictly through their letters and emails is a nice change of pace from the usual conventions of the novel. Youngson did well in avoiding pitfalls like sappiness, plotlessness and predictability. It's a quick read that is light in the experience of reading, but deep in characters and content. In this epistolary novel, two people meet over their common love of the Tollund Man, both a true archaeological find and the subject of a poem by Seamus Heaney. In 1964, Tina Hopgood was in a class with Danish Professor who talked to them about the Tollund man. Tina, a married woman of middle age who resides on an East Anglian farm, attempts to get in touch with this professor by mail. She receives notice from the museum's curator, Anders Larsen, that Professor Hopgood died a while ago. Thus beg In this epistolary novel, two people meet over their common love of the Tollund Man, both a true archaeological find and the subject of a poem by Seamus Heaney. In 1964, Tina Hopgood was in a class with Danish Professor who talked to them about the Tollund man. Tina, a married woman of middle age who resides on an East Anglian farm, attempts to get in touch with this professor by mail. She receives notice from the museum's curator, Anders Larsen, that Professor Hopgood died a while ago. Thus begins their letters back and forth. Anders is a widow who is still grieving his wife's suicide last year. He was aware of how ephemeral and unpredictable she was but he wasn't prepared to lose her just yet. He loves his work at the museum but is lonely and, other than his adult children, has no one to talk to. He tells Tina "not to be angry with the circumstance of your life. As your daughter said, nothing is so fixed it cannot be altered." As the letters proceed, their relationship takes on a very deep and significant part of their lives. They confide in one another, discuss their dreams and heartaches, as well as sharing their day to day lives. Eventually the letters take on the most meaningful aspects of their days and lead to an emotional affair of the heart. I think i have never rooted for a couple more than i do in this book. That being said, i wholeheartedly believe that Anders and Tina belong together, despite living in separate countries, leading vastly different lives, and having never seen each other. Their story gives me hope, really. When two people are thrown together by chance, who is it to say it is not fate? When they find each other coincidentally, it is their choice to keep writing to each other and bare their souls that bring them close I think i have never rooted for a couple more than i do in this book. Their story gives me hope, really. When two people are thrown together by chance, who is it to say it is not fate? When they find each other coincidentally, it is their choice to keep writing to each other and bare their souls that bring them closer emotionally. I feel for the loneliness each brings to the table, the quiet suffocating feeling you tolerate just to go on living. I want to weep and cheer for them alternately, because they are just so human, so flawed, so real. So I finished this cute novel within a day and it was very enjoyable experience that I highly recommend you to read it! Anne is very talented Author, her writings are very sensitive and thoughtful, she really knows how to bring drama and romance altogether! The novel is told exclusively by letters between two strangers Tina Hopgood a farmer's wife in England, and Anders Larsen the curator at a Danish museum! The main characters are very well connected and it makes you read it every line within th So I finished this cute novel within a day and it was very enjoyable experience that I highly recommend you to read it! The novel is told exclusively by letters between two strangers Tina Hopgood a farmer's wife in England, and Anders Larsen the curator at a Danish museum! The main characters are very well connected and it makes you read it every line within the novel! In the letters are displayed all their lives, loves and losses, it really is a plaintive novel! Tina and Anderson's letters are met by accidental, as Tina wrote to prof.Glob about the Tollund Man which she longs to see for herself! As the prof.Glob has died and Anders a museum curator at the Danish museum responds to her! And they continue to share letters to each others as their friendship grows more and more while writing and about their detailed lives! The letters are pretty much the description of Anders and Tina's life decisions, the reasons behind them, it really brings a very interesting and intriguing acts of what they come to as the novel gets even better in the last pages! As her best friend dies, Tina really struggles with some answers of her decisions, she really needs to find a meaning or a purpose of some of her main settlements! I really find this novel very interesting and professional as Anne is a debut Author and I cam call this Year as the Year of the Debut Novels, as I've read the greatest debut novels of all time! 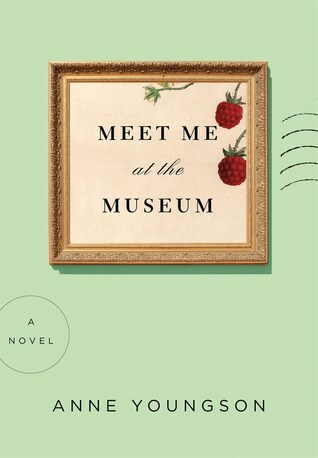 Meet Me at the Museum is an epistolary novel focused on the letters exchanged between Tina, a hardworking farm wife of three children and a museum curator and widower named Anders in Denmark. Their unlikely correspondence begins when Tina's seeks more information about the museum's most famous exhibit, The Tollund Man. I don't mind novels written in letter form, for example Letters from Skye but it tends to be a restricted art form since the author's method of telling t Meet Me at the Museum is an epistolary novel focused on the letters exchanged between Tina, a hardworking farm wife of three children and a museum curator and widower named Anders in Denmark. I don't mind novels written in letter form, for example Letters from Skye but it tends to be a restricted art form since the author's method of telling the story is telling, rather than showing. The premise is predictable as Anders and Tina bond over their interest in the Tollund Man and begin to share aspects of their personal life and deep fears and insecurities that their lives did not progress as they had envisioned when they were young and had big dreams. The writing is kind of stiff, almost formal, but that may be due to the ages of the letter writers. I wouldn't call it boring but I wouldn't say it held my interest. I found the Tollund Man more interesting than the main characters, mostly because I saw bog bodies at the National Museum in Dublin two years ago and it was fascinating! When Tina's life is upended because of her husband's adultering, (ho hum), she must decide how to go on with her life and if that includes Anders. "A touching epistolary novel about a an English farmer’s wife and a museum curator who may be in for an unexpected second act." In the likeness of 84, Charing Cross Road. A moving story of two pen pals and their growing relationship as they begin to share their stories of their lives: what it feels to be happy, lonely, and evaluate what their purpose is in life, their sacrifices, their role as a spouse, parent, grandparent. Their choices that have led them together. The ending did disappoint me, of what will become of Anders and Tina. I mentioned in past reviews on these similar endings - this should not be my story, so f In the likeness of 84, Charing Cross Road. A moving story of two pen pals and their growing relationship as they begin to share their stories of their lives: what it feels to be happy, lonely, and evaluate what their purpose is in life, their sacrifices, their role as a spouse, parent, grandparent. Their choices that have led them together. The ending did disappoint me, of what will become of Anders and Tina. I mentioned in past reviews on these similar endings - this should not be my story, so finish it. This is the writers’ story, not ours - so, basically, finish the ending. We have been talking to each other about where life went, and if the way we each spent it was the way we meant to have spent it or would have chosen to spend it if we had known when we made our choices what the choices were, but we have not wasted our lives. We should look inside ourselves for fulfillment. It is not fair to burden children or grandchildren with the obligation to make us whole. Our obligation to them is to make them safe and provide them with an education. I am happy because I love my daughter and want her to be happy but have had no idea how to bring this about since she stopped wanting me to play with her. This is a very thoughtful, small book. (Small in the physical sense--about the size paperbacks used to be.) Very quick read because everything is done in letters (both paper and electronic) between a farm wife and museum curator. Could any two lives be more different? One works with her hands all day, the other with his mind. But as the curator sums it up, "We have both arrived at the same point in our lives. More behind us than ahead of us. Paths chosen that define us. Enough time left for us t This is a very thoughtful, small book. (Small in the physical sense--about the size paperbacks used to be.) Very quick read because everything is done in letters (both paper and electronic) between a farm wife and museum curator. I think book clubs would have a great discussion about the raspberry motif. Tina, the farmer's wife, says she feels life is like picking raspberries, because you make one swipe down, think you got them all, turn to go behind it and see everything you missed. She sees what she "missed" in life. I don't know about that. Sometimes berries aren't ripe to pick or you don't want to pick certain berries anyway. You can't do everything in life. I thought it was funny when the curator, who is Danish, says he would hate to live in Tina's farmhouse because it's so cluttered. His apartment is rather stark! A very quiet novel with themes of memory, new beginnings, and friendship. I love the use of the format of letters to tell the story of these two characters, but ultimately I didn't enjoy this as much as I thought I would. I had never heard of the Tollund Man before, so that was interesting, overall a pretty standard read. This book is a story told entirely through the use of letters. The letters are written between Tina Hopgood, a woman living on a working farm in England, and Anders Larsen, the curator at an archaeological museum in Denmark. These letters begin in anonymity, and are inquiries in a businesslike correspondence. But as the correspondence continues, both Tina and Anders begin to be more casual, friendly, and sharing of their current lives, both the physical and emotional aspects. As they share their This book is a story told entirely through the use of letters. The letters are written between Tina Hopgood, a woman living on a working farm in England, and Anders Larsen, the curator at an archaeological museum in Denmark. These letters begin in anonymity, and are inquiries in a businesslike correspondence. But as the correspondence continues, both Tina and Anders begin to be more casual, friendly, and sharing of their current lives, both the physical and emotional aspects. As they share their hopes, disappointments, joys and sorrows, they begin to help each other to explore their own thoughts and feelings, and to come to greater clarity not just about each other, but also about themselves. Their letters become increasingly important to each of them, as they grow into an intimacy and deep friendship. When this book ended, I was left wanting more, and hoping for a sequel. But even without that, I certainly enjoyed this one immensely. This book satisfies challenge #4, to read a book with a theme of love, in the group A Book for All Seasons.